The conditional formatting dropdown-menu provides you with preconfigured formatting templates and your individual formatting drafts. To delate a draft choose the formatting in the dropdown-menu and click on Remove Formatting. 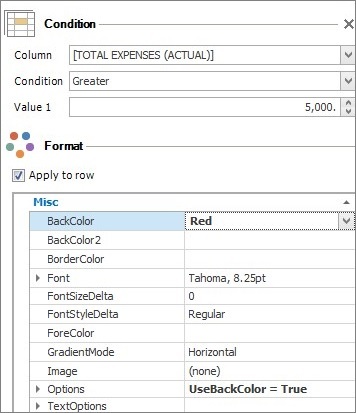 The simple formatting compares the value of a field with a pre-defined reference value. In the following example all projects whose actual expenses exceed a specified value will be marked red. 1. Let’s start from the project list. Click on Conditional Formatting in the start tab. 2. Select Add Simple Formatting in the dropdown-menu. A side panel will open on the right side. There you can define the formatting. 3. Choose Total Expenses (Actual) in the Column field. 4. Choose the argument Greater than in the Condition field. 5. Enter the reference value 5,000 in the Value 1 field. 6. Define the formatting in the Format area, e.g. BackColor red. Activate the check box Apply for cell in order to format the whole cell of the project in the project list. All projects whose total expenses exceed 5,000 will be marked with red in the project list. Extended formatting allows the calculation of a value and compares it with a pre-defined reference value. For those calculations you can use more than one field as a variable. The following example will examine, if a projects’ actual expenses exceed the planned expenses. 2. Select Add Extended Formatting in the dropdown-menu. A side panel will open on the right side. There you can define the formatting. 3. Click on the following icon on the side panel. 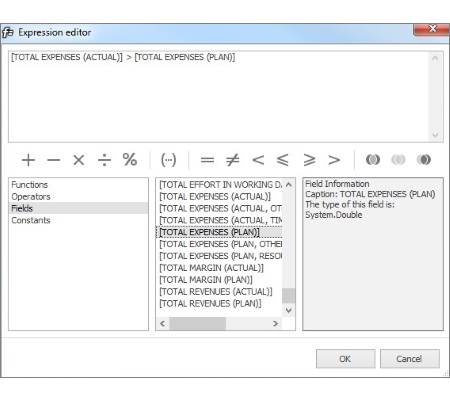 Thereby you open the dialog box Expression editor for specifying the formula and calculating field values. 4. Click on Fields in the left column. 5. Select Total Expenses (Actual) in the middle column by double-clicking. 6. Select the relational operator greater than >. 7. Select Total Expenses (Plan) in the middle column by double-clicking. Afterwards click on Ok.
8. You can define the formatting in the Format area in the same way as when using simple formatting. Activate the check box Apply for cell in order to format the whole cell of the project in the project list. 9. All projects which meet the defined conditions will be marked in the project list. Conditional formatting as a warning system • Copyright 1999-2019 © InLoox, Inc. All rights reserved.